The jazz saxophone studio at the University of Tennessee is designed to provide students with the fundamental knowledge, professional wisdom, and versatility to become ready for the highly competitive international jazz scene. It is led by an internationally acclaimed jazz musician, who has spent numerous years touring the world with many of the actual architects of this music and modern masters of this era. In this studio, students are challenged to develop the skills necessary to take their playing and performance abilities to a higher level. 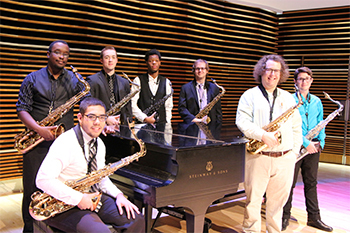 Each jazz saxophone major will receive a weekly one-hour lesson with Professor Tardy. These lessons meet each player where they are and progress them further in developing fundamental, technical and improvisational skills. Fundamental skills include developing a personal sound, basic saxophone technique, and sight-reading. All students learn some basic elements of saxophone repair; for good saxophone maintenance helps overall performance consistency. Jazz saxophone majors regularly study the clarinet and flute, as these doubles can open up many professional opportunities. The technical skills to be focused on include scalular studies, application of jazz harmony, study of the basic elements of improvisation, rhythmic studies and stylistic approaches. The other major area we focus on is improvisational skills. We approach this through a combination of music theoretical studies and transcription. Transcription is effective for ear training while also teaching style, technique, vocabulary, repertoire, the historical lineage of the saxophone and it teaches students to analyze and think critically about music; serving as a catalyst for further study. As well as exploring the Great American Songbook, all jazz majors study compositions by the great jazz masters of yesterday and today. Each week the jazz saxophone studio meets together for Solo Class, held on Tuesdays from 12:40-1:55. This class provided an opportunity for group study covering subjects such as sight-reading, repertoire and saxophone maintenance. All jazz saxophone majors are required to take part in the small group ensembles. There are also opportunities to audition for either the jazz big band and/or the jazz studio orchestra. In addition, all jazz saxophone majors are required to give a half-recital near the end of their junior year and a full recital near the end of their senior year. Saxophonists are sometimes asked to participate in fellow students' recitals. Finally, many students perform regularly in venues, in and around the Knoxville area.